A native to Arizona, Texas, and Mexico. Common name refers to tightly coiled seed pods. (Tornillo) Small tree or large shrub. Tree is typically multi-stemmed and the bark is fibrous or stringy. Very open and spreading habit. 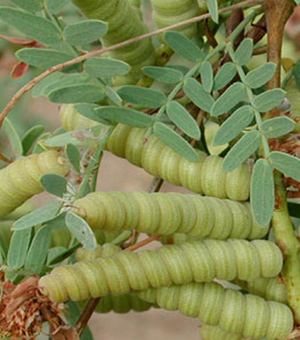 The leaves are smaller than other mesquites and are characterized by one pair of pinnae with 5 to 9 pairs of leaflets per pinna. Each leaflet is 3/8" to 1" in length. The small 3/4" spines are whitish, slender and appear as pairs along the branches. The flowers in spring, are bright yellow catkins, 1/4" wide. Mesquites are among the most dominant and significant trees of the southwest.